Iphigenia is a famous female character from the tales of Greek mythology. A daughter of King Agamemnon, Iphigenia was put on the sacrificial altar by her father, to appease the goddess Artemis. Iphigenia was born a princess of Mycenae, for Iphigenia was most commonly called a daughter of King Agamemnon and Clytemnestra. Thus, Iphigenia was sister to Orestes, Electra and Chrysothemis. On her mother’s side, Iphigenia had some famous relatives, with Helen, wife of Menelaus, being her aunt, and grandparents in the form of Tyndareus and Leda. Via Agamemnon though, Iphigenia was a member of the cursed House of Atreus, for her grandfather was Atreus, her great-grandfather Pelops, and her great-great-grandfather was Tantalus. A less common version of the story of Iphigenia gives different parentage for the girl, for then it is said that Iphigenia was in fact the daughter of Theseus and Helen, born when the Athenian hero had abducted Helen from Sparta. Helen had subsequently given her daughter to her sister Clytemnestra, who had raised it as her own. The story of Iphigenia is not one that appears in the Iliad, the work of Homer, although Homer does make mention of a daughter of Agamemnon called Iphianassa, which may or may not be an alternate name for Iphigenia. Much of the tale of Iphigenia is thus taken from other writers, including Euripides. Now as a member of the House of Atreus, Iphigenia was perhaps doomed from birth, but whilst many members of the House of Atreus only added to their predicament by their actions, Iphigenia was innocent of what was to befall her. Whilst Iphigenia was relatively young, events which would lead to the Trojan War would begin to unfurl. In the absence of Menelaus, Paris came from Troy abducting Helen, and stealing Spartan treasure. Thus it was that the Suitors of Helen were called upon to uphold the Oath of Tyndareus, to protect Menelaus and to bring back Helen from Troy. Now Iphigenia’s father had not been a Suitor of Helen, but he was the most powerful king of the era, and so Agamemnon became the commander for all the heroes and men who responded to the call to arms; and as a result, at Aulis, an armada of 1000 ships gathered. With ships and men ready there was but one problem, and ill wind meant that they Achaeans could not sail for Troy. ​It was the seer Calchas who told Agamemnon that the goddess Artemis was angered by one amongst the Achaean army. That one normally said to be Agamemnon, and for that reason Artemis had decided to keep the Achaean fleet at Aulis. Various reasons are given why Artemis might have been angered, but commonly it was said that the hubris of Agamemnon, comparing himself with the hunting skill of the goddess, was to blame. It was also Calchas who told Agamemnon the method by which Artemis could be appeased, a sacrifice was required, but not a normal one, a human sacrifice, and the only suitable victim was to be Iphigenia. The idea of human sacrifice was a reoccurring one in Greek mythology, although not a common one, but human sacrifices were offered to the Minotaur, whilst Tantalus and Lycaon killed their own sons to make an offering to the gods. As to whether Agamemnon was agreeable to the possibility of Iphigenia being sacrificed depends on the ancient source being read. Some tell of Agamemnon deciding to call off the war rather than sacrifice his daughter, whilst others tell that Agamemnon saw it as his duty to do what Calchas suggested. Even if Agamemnon was not willing though, it would appear that he was eventually convinced by his brother Menelaus, for plans for the sacrifice of Iphigenia were made. Iphigenia was in Mycenae at the time when the ships gathered at Aulis, and there was no way in which her mother, Clytemnestra, could be convinced to sacrifice her daughter; and so Agamemnon did not even try. Instead, a lie was told to bring Iphigenia and Clytemnestra to Aulis; Agamemnon would send word back to Mycenae via Odysseus and Diomedes, who told Clytemnestra that it had been arranged for Iphigenia to marry Achilles. Such a marriage was a highly suitable one for Iphigenia, and as a result, Iphigenia and her mother came to Aulis; at which point Iphigenia and Clytemnestra were separated. ​With a sacrificial altar constructed, Iphigenia would have been very aware of what was to befall her, but most ancient sources tell of Iphigenia willing climbing onto the altar, believing that her death was necessary, and it would become known as a heroic death. A problem did arise when it came to who was going to sacrifice Iphigenia, for none of the assembled Achaean heroes were willing to kill the daughter of Agamemnon. Eventually it was left to Calchas, the man who had said that the sacrifice was necessary, to kill Iphigenia, and so the seer wielded the sacrificial knife. ​In the simplest versions of the Iphigenia myth, Iphigenia’s life came to an end by Calchas’ knife, but few human sacrifices ended as they were supposed to in Greek mythology. For, even in the case of Pelops, the son of Tantalus was brought back to life, after he had been killed by his father. Thus it became common to say that in the end Iphigenia was not actually sacrificed, and as Calchas brought down the knife to kill the daughter of Agamemnon, the goddess Artemis intervened, spiriting Iphigenia away, and substituting a deer in the girl’s place. Artemis though ensured that all those who witnessed the sacrifice of Iphigenia, did not recognise that a substitution had taken place. After the sacrifice had been performed though, the ill winds that had kept the Achaean fleet at Aulis abated, and the journey to Troy could begin. ​The sacrifice, or supposed sacrifice, of Iphigenia, would have deadly consequences for Agamemnon. Agamemnon would survive ten years of fighting at Troy, and yet on his return home to Mycenae he was murdered. In his absence fighting, Agamemnon’s wife, Clytemnestra had taken herself a lover in the form of Aegisthus. Aegisthus had many reasons for wanting Agamemnon dead, but it was commonly said that Clytemnestra had but one reason for wanting her husband death, the fact that her husband had arranged for the killing of their daughter. ​Thus, a helpless Agamemnon was killed by Clytemnestra and Aegisthus as he took a bath. ​It was only after the death of Agamemnon that the story of Iphigenia re-emerged in Greek mythology, with Iphigenia appearing in the tale of her brother, Orestes. When Artemis had substituted the deer for Iphigenia, the goddess had transported the daughter of Agamemnon to the land of the Tauri, a land normally equated with modern Crimea. Artemis then appointed Iphigenia as the priestess of the goddess’ temple in Tauris. Having escaped from becoming a human sacrifice, Iphigenia now found herself in charge of undertaking them, for the Tauri, sacrificed all strangers to their land. ​Many years would pass but then the paths of brother and sister would cross, for Orestes would come to Tauris. Having avenged the death of his father, Orestes was now being pursued by the Erinyes for killing his mother Clytemnestra, and it was said that Apollo told Orestes that by stealing the statue of Artemis from Tauris. Thus, Orestes and Pylades came to Tauris, but as strangers they were promptly arrested, and were set to be sacrificed, when Iphigenia came to the prisoners there was no recognition between siblings, but Iphigenia did offer to release Orestes if he would take a letter back to Greece. 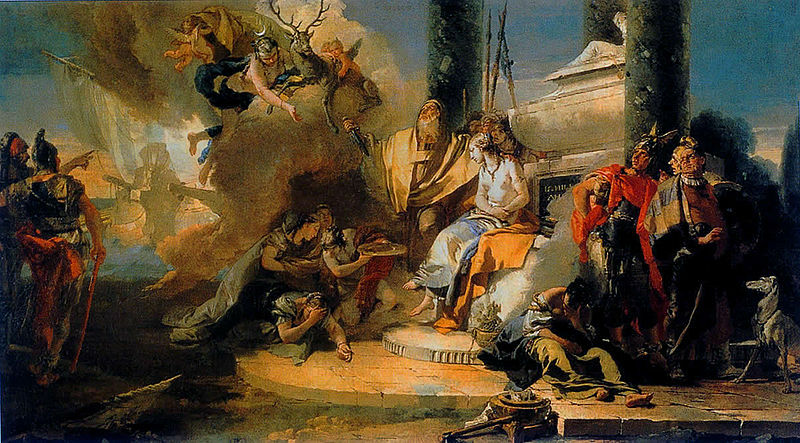 Orestes refused to go if it meant leaving Pylades behind to be sacrificed, and instead, Orestes requested that Pylades go with the letter instead. ​The letter written by Iphigenia proved to be the key to brother and sister recognising each other, and so a new plan was put into operation, and with Iphigenia’s knowledge, Iphigenia, Orestes and Pylades were soon on-board Orestes ship, leaving Tauris, with the statue of Artemis in their possession. ​Even as Iphigenia, Orestes and Pylades returned to Greece, stories from Tauris preceded them, and it was said in these tales that Orestes had been sacrificed. This left Electra, the sister of Iphigenia and Orestes devastated, but also emboldened, Aletes, son of Aegisthus, who now seize the throne of Mycenae. In response to the news from Tauris, Electra travelled to Delphi to enquire what the future would now hold for her. 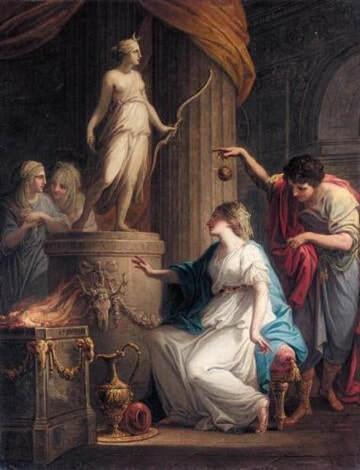 Fate, of course, conspired to ensure that Electra arrived at the same time in Delphi as Iphigenia, but again siblings did not recognise each other, and indeed Iphigenia was pointed out to Electra as the priestess who had sacrificed Orestes. Electra thus planned to kill the woman who had “killed” her brother, but as Electra was about to attack Orestes would appear by Iphigenia’s side, staying Electra’s attack, and explaining all that had gone on before. So, the three children of Agamemnon, now reunited, return to Mycenae, and Orestes kills Aletes, and thus becomes ruler of the kingdom which was his birthright. ​The story of Iphigenia effectively comes to an end, with the daughter of Agamemnon spoken of but infrequently afterwards. Some tell of her dying in the town of Megara, upon the Isthmus of Corinth, a town, coincidentally, which was the home town of Calchas, the seer who would have sacrificed her. 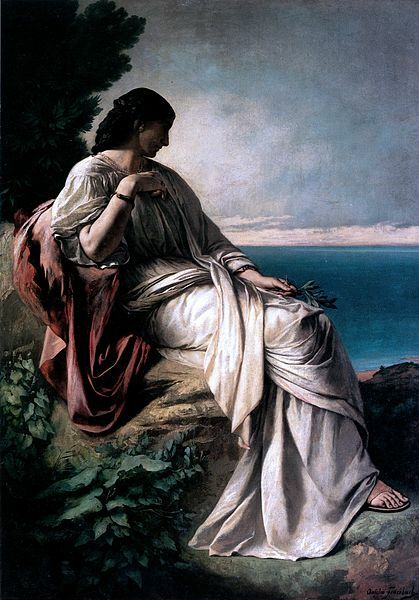 ​After her death, it was said that Iphigenia was a resident of the White Island, or Isles of the Blessed, the equivalent of paradise in the Greek afterlife. It was also commonly said that in the afterlife Iphigenia was wed to Achilles, and thus the promise which had seen her delivered to Aulis came to fruition.